Seriously, does it get any cuter than this?!? This knitting shop was overwhelmed with penguin sweaters! They are now stockpiling them for any future need. This is an absolutely heartwarming story. Click HERE to read it and to see more pictures of penguins in sweaters. You'll be glad you did :) Have a great weekend! Absolutely adorable! I am going to show this to the girls. We like to watch penguin videos on youtube, they are so funny and playful. So sweet! Thanks for sharing. Aww that IS the cutest thing ever!! Very heartwarming! Thanks for sharing Gwen! This is so cute! I have a dear friend who collects penguins...she would love this!!! Aww! 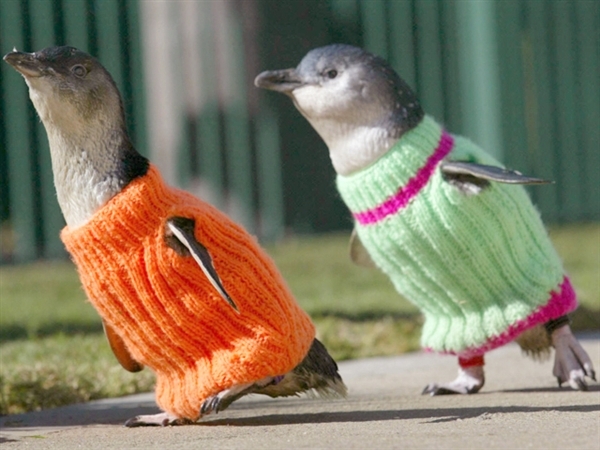 This makes me wish I knew how to knit just to be able to send them a few more penguin sweaters. Hi Gwen..the penguins are so adorable in their new woolly suits! Thank you for sharing this and putting a big smile on our faces today. Have a great weekend! when I read the title of the post I thought that it was stupid to dress up a penguin, but now I understand everything...and they re cute! !